I bet if you polled most people, they wouldn’t use the words slapstick and silly to describe the work of William Shakespeare. I would imagine the average person might say stuffy, old-fashioned, and maybe even boring. Thank goodness, then, for Cincinnati Shakespeare Company and their current production of THE COMEDY OF ERRORS. It is anything but boring; in fact, I left after the show feeling completely satisfied, which if I’m being honest, has never happened following a Shakespearean play on stage anywhere. I credit much of this success to the direction of Patrick Flick. Flick is making his debut with CSC and I hope he’s back again and again. Not to take anything away from the usual directoral staff, but there is something quite fresh about Flick’s approach. There’s a cohesion in this show, the pacing is smooth, and there’s a sense that the actors tapped into some new and infectious energy that has brought them to life more than we’ve seen in sometime. For those not familiar with the story, its a tale about two sets of twins, mistaken identities, and pure unadulterated chaos in relationships with wives, merchants, and the government. Things break down into pure mayhem until there’s a wonderful resolution at the end where everyone leaves happy . . . including the audience. Jeremy Dubin and Paul Riopelle (the “Dromio” twins )look so much alike I actually was tricked at one point towards the beginning of the show. Justin McCombs and Josh Katawick (the “Antipholus” twins) look close enough to the same to make the story work. McCombs and Dubin are especially fine comedians, we all know that, but Riopelle and Katawick more than held their own. The physicality of Dubin’s performance is astounding and will be a true highlight of the season. Also awe-inspiring is the performance of Miranda McGee; she gives a wild, manic, and hilarious speech that brought the generated rousing applause. She is on-stage dynamite. Billy Chace, Maggie Lou Rader, Brent Vimtrup, Andrew Gehrlein, Abby Rowold, and Caitlyn McWethy also shine on stage. I loved the circus theme as a backdrop; it fits nicely with the farce and everyone felt at home on stage and in their costumes (marvelously designed by guest artist Noelle Wedig.) Doug Borntrager’s sound design was as exceptional as we’re accustomed and Andrew Hungerford’s set and lighting design are more than competent as always. This is a great way to introduce someone to Shakespeare; it’s an easy story to follow, the physical nature of the acting is entertaining and engaging, and I can’t say enough good things about this production. I’m so glad I saw it and you should too. 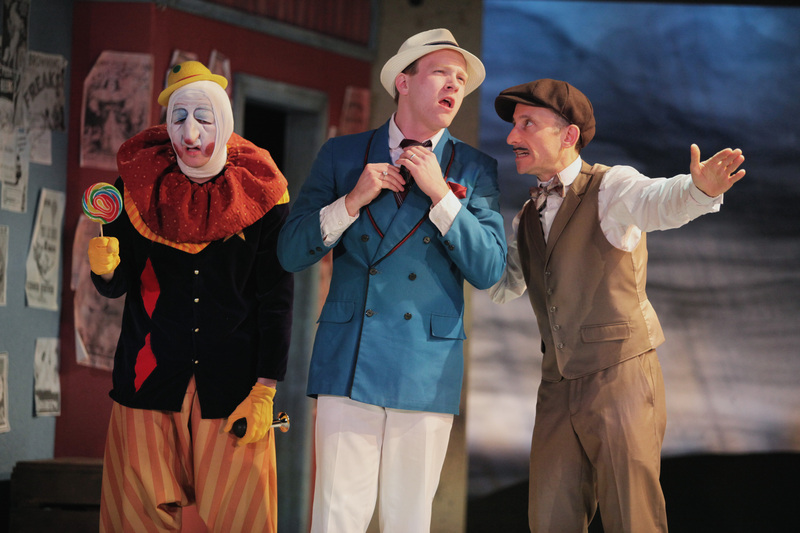 THE COMEDY OF ERRORS runs through December 13th at Cincinnati Shakespeare Company downtown on Race Street. Tickets and more information can be found here.